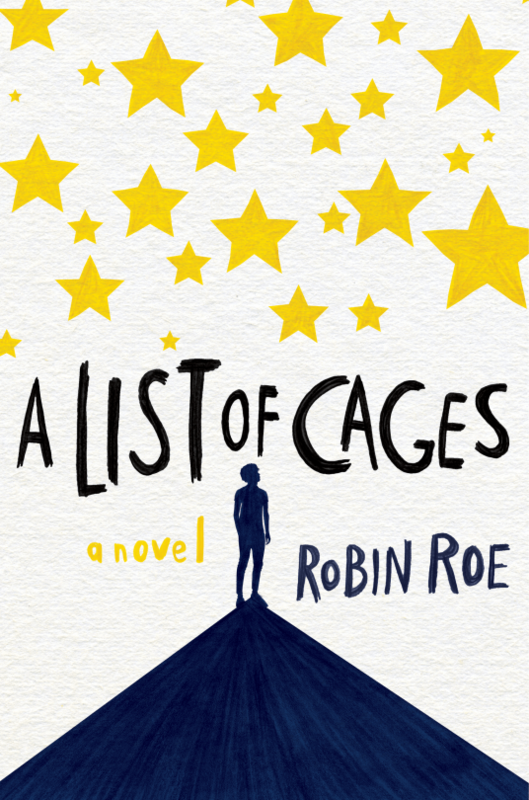 A List Of Cages by Robin Roe is a book that absolutely gutted me. I still feel emotional thinking about my second read of 2017. This is a book that hit really close to home, as my career field of choice is human services-social work. And well, A List Of Cages is one read where it was impossible to take off my social work hat. Frankly, that’s okay with me as I love my field and this book reminds me that those in my field do great work. It also reaffirms why I do the work that I do. A List Of Cages follows the point of view of two boys – Julian and Adam. The two have various connections to each other as they weave in and out of each other’s lives. You see, at first, Julian and Adam were reading buddies. What this means is that when Adam was in fifth grade, his class had a volunteer project where they helped the kindergartners read. Julian was placed with the kindergarten reading group despite actually being in second grade. Then, later on, they interacted due to Adam’s mom taking on Julian as a foster kid. Now, in present day as the book is set – their lives cross paths when Adam is serving as an office aide to the school psychologist. His job is to track Julian down and bring him to his office visits with the psychologist. Over time, they begin to renew their friendship. Adam begins to suspect that there’s something shady going on with Julian’s home life, but to tell anyone or to act on the knowledge may put the lives of both boys at risk. So, I’m going to get all social worker on you when talking about Julian BECAUSE I CANNOT HELP IT YOU GUYS. So, Julian is a primary example of what can happen when the system fails kids at every turn. I see consistent interactions in Julian’s life being not trauma informed. Julian, FYI, has undergone some major trauma in his life. Trauma informed means that you operate from a mode of understanding trauma and use evidence based practices to work with some. Instead of asking from a blaming standpoint, you ask “what happened to you” and recognize that trauma. So, that out of the way so many adults just fail Julian over and over. First, Julian has a learning disorder which seems to be undiagnosed. Yet, no one really goes to bat for him to get an IEP with reasonable accommodations and extra help. Instead, it seems Julian is just passed from grade to grade. Teachers are mean to him too, instead of being understanding of his needs and why he isn’t learning according to their time table. At heart though, Julian remains a kind souled kid despite having every reason to be a mean, hateful, spiteful person. He’s not. He rises above that, but he still has his issues for sure. Julian is very timid and has no friends in his grade. He’s bullied. He isn’t adequately cared for. Thank goodness for the kindness of another person, Adam. Adam is a relatively popular senior boy. Adam also happens to have ADHD. He and his mother approach his treatment in a variety of ways. At first, they tried medication. Then, they tried changing his diet. Adam uses different strategies to manage this. I loved that. It rings true to life. Anyways, so Adam lives with just his mother who is a social worker and who has fostered a number of children over the years. When Julian is back in his life as part of his office aid work, Adam treats him with dignity and kindness. He doesn’t laugh at or judge Julian. Instead, he works on integrating Julian into his friend group. This very integration, FYI, made me cry several times. Actually, I am tearing up typing this and thinking about it. HORMONES! So, Adam is someone that we in the social work world would say operates from a strength-based approach. He doesn’t immediately connect with Julian and tell him all the things that are wrong with him. Instead, he focuses on his strengths. He lets Julian know that he is a good writer. He lets Julian know that he has a good heart. Adam acts as a wonderful support and resource for Julian. However, there’s a few moments where Adam makes some missteps, as he is a human and a teenager. A List Of Cages by Robin Roe takes on some very heavy themes. Child abuse and trauma factor heavily into this book and into Julian’s life. I will have you know that I sobbed, just buckets on buckets, of tears from halfway through the book all the way until the end of the acknowledgements (not that the acknowledgements were sad, I just had a lot of emotions). As I said, this book hits really close to home to me. If you think that Julian’s story sounds too tragic to be true, I assure you that you are very wrong and likely leading a very charmed life. However, lest you think I make this book sound too dark, I will say that this book illustrates that it is always darkest before the dawn. There is hope and the ending is powerful and affirming. And an aside for my other social workers out there I was struck by a few things: 1) When Julian misses school on a consistent basis for three days at a time, why wasn’t a report made to child protective services? This is what we call educational neglect in the field and questions really should be asked. In NY this is considered reportable. 2) The school acknowledges that Julian needs to see the psychologist, yet, he clearly has all these issues reading, why does he not have an IEP (individualized education plan) and how has he not had a CSE meeting (Committee for special education)? I suppose I could answer this by saying his uncle who has custody of him isn’t very involved, but even so, his grades are definitely cause for concern. 3) There’s accuracy in how the law guardian (lawyer for the children, guardian ad litem) whatever you call it in your state is represented. This is the first book I’ve read where there’s actually a law guardian and thus, it’s awesome to see someone representing the child welfare system accurately. 4) There’s a few red flags in Julian’s interactions and events that made me feel concerned, but apparently did not concern the school psychologist all that much? Hmmm. Anyways, in all, this is one of the better books that has connections to social work out there. I’d like to act with more empathy and less immediate snap judgment. If someone is being rude to me, instead of being rude back, I’d like to ask myself if maybe they are having a bad day and treat them with more empathy and kindness. I’d like to try to do at least one random act of kindness per month. I think that this is especially important with a child on the way, because I’d like to model how to be a good person for my child. I’d like to continue to donate books to those who are in need (selfish goal though because this benefits my decluttering goal). Robin Roe has a bachelor’s degree from Cornell University and a master’s from Harvard. She counseled adolescents in Boston before she moved to Dallas, Texas to run a mentoring program for at-risk teens. This is her first novel. I always try to do kind daily, if I can. A kindness goal I have for 2017 is to let more people come off of side streets/shopping lot exits in front of me while inching along in traffic. I am going to help my elderly neighbors with making sure they are okay and if they need help. I am going to help others in any way I can. This year, I want to focus on patience and truly listening when others speak to me. I want to be kinder to my neighbors. I had not heard of this but really like your social worker analysis. As a former teacher I stress about characters too, probably because I want the young readers to learn their rights, too. Also, like your goals! I am working on personal kindness, but also want to get a job that alows me to help others. I do volunteer and donate but want to do more. This year I’m going to try and keep up on emails. I have a tendency to let them sit for weeks/months and feel like a jerk. Patience is certainly something I’m working on as well! I’d like to try to work on being more patient with others. My goal is to do more volunteer work. My kindness goal for 2017 is to focus more on thinking before I speak, being more caring and understanding using my words, especially when in an argument. My kindness goal for 2017 is to smile more and give more small gifts at random to my friends. My kindness goal is to have a bit more patience. My kindness goal for 2017 is make time to volunteer more! Thanks for the great post and giveaway! My kindness goal is to offer advice that will help people in the long run. A kindness goal I have for 2017 is to do more volunteering more and do random acts of kindness. My kindness goal this year is to become a better listener. I want to volunteer and donate to my local shelter. My kindness goal for the new year is to be a bit more patient and try and see where others are coming from on issues where we do not agree. My goal is to reconnect with old friends and let them know I like having them in my life. To speak up against injustices. I want to help deliver meals on wheels for our Senior Center. A kindness goal is to donate more and do some volunteering. My kindness goal for this year is to do more little acts of kindness! My son came home the other day and told me how he was arguing with a state trooper at Mcdonalds…because he wanted to buy his meal. The State trooper said he didnt have to…but my son told me that he always does that we he sees law enforcement getting food. I had no idea he did this….and was so proud of him. My son did finally win…and got to buy the troopers lunch. Proud mommy moment! I’d like it to be a general sort of goal. To just be more in the moment and react with empathy, particularly with those I interact with every day. Thanks. I want to try to pay it forward more this year. I try to help others year round! I want to do a lot more pay it forwards at Dunks and Starbucks! It is so fun to do. I am going to pay it forward by giving time to the local animal shelter. I’m working on my level of patience with my kids and grandkids. I goal is to try to be more patient with the people that irritate me and show them love. My kindness goal is to help my neighbor whose husband passed away and sh e can not shovel the snow which i have been doing for her but I just plan on being there for here in whatever way she needs me. I want to volunteer more time at the rehab facility that took such good care of my mom when she was there. My kindness goal for 2017 is to donate to more animal shelters in the area. I want to donate more to our church! I feel like I am a very kind person, but I would like to be more helpful. I currently work at a nursing home and I would like to start volunteering. I vow to consider to give everyone the benefit of the doubt. I think to donate more, my time at my daughter’s school. I’m gonna try to find some more volunteer activities in which I could make a positive impact on my local community. I need to pay it forward more. I help older people at the grocery store and lot. I think a goal for kindness would be to have more patience. I want to be more patient and understanding. My goal for 2017 is to show my kids how donating food, toys and clothing to local shelters really is a wonderful and heart warming thing to do. To not judge. We don’t know everyone’s backstory. I am going to be kinder to my inlaws.. I would like to continue what I’m doing.. I’ve been told by several people that I’m a very kind person. I BRING EXTRA SNACKS TO MY SON’S SCHOOL FOR THOSE KIDS WHO DON’T HAVE ANY. I’ve already achieved a few kindness goals and am going to continue on throughout the year. I’m a big fan of paying it forward. I keep an ear/eye out for people that might be low on money or can’t find change fast enough and I pay it. If I see an expired meter, I feed it. Even holding the door for people has become rare these days, so I always hold the door. My kids, ages 4 and 6, see me doing these things and do them too. The smallest gestures can make the biggest impact. A List of Cages sounds incredibly powerful, and it was so interesting to read your thoughts on it! I really love that you felt like this was an honest portrayal of a tough real life situation that many individuals actually go through, and that you really connected with the story. Definitely adding this to my list of books to check out!